For the month of April only, play 18 holes with a cart for just $25! Play golf at Central Ohio's finest links-style course. Located in Springfield, Ohio. Enjoy lunch and dinner at The Stables, our full-service restaurant and bar. Springfield's finest facility for weddings, family gatherings and corporate events. ...all at Windy Knoll Golf Club, Central Ohio's Premier Links Style Golf Course. Over the past three years, we have worked hard to improve all of our facilities for our patrons, whether they they are here to play golf, dine at The Stables, shop in the Pro Shop or gather for an event in our banquet hall, The Derby. 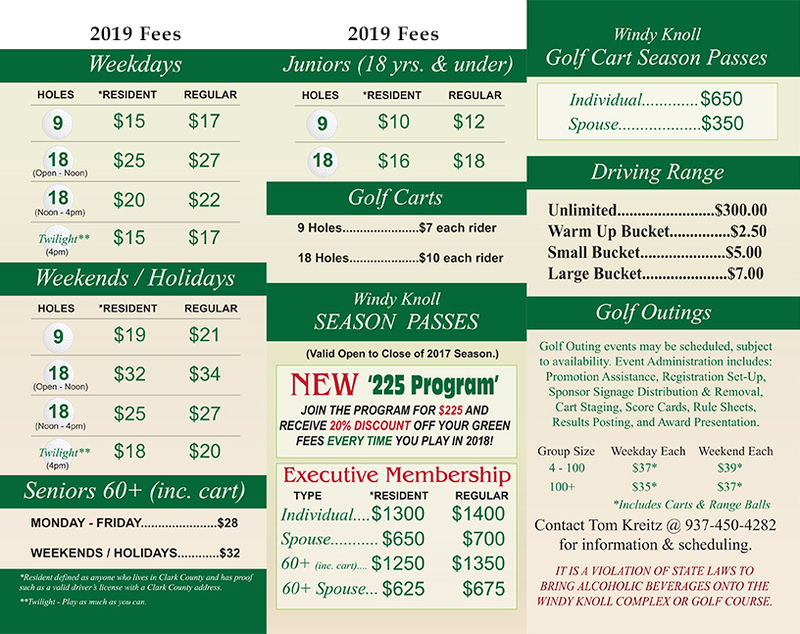 We have made a significant investment in our facilities and the course, which we believe continues the fine tradition of Windy Knoll and enhances the experience. $25 for 18 holes with cart.